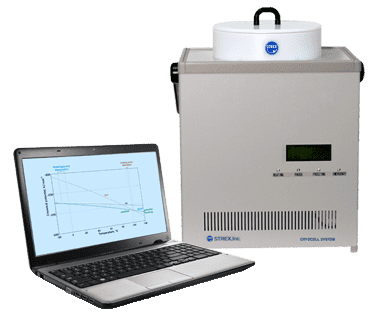 The Controlled Rate Freezer is a system that can cryopreserve your precious cells and maintain high cellular viability for your research via controlled rate freezing. 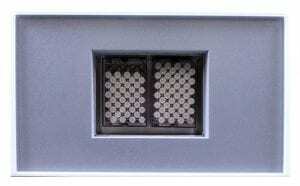 The compact, cryogenic benchtop system is simply plugged into a standard wall outlet and connected to a designated laptop via USB cable. A custom freezing protocol can be easily programmed with the user-friendly complimentary software. Cell samples are loaded into the custom aluminum freeze block (vials, straws, etc.) or ethanol bath (vial racks or bags) within the system and are ready for cryopreservation to commence. The powerful Stirling cooler system cryopreserves the cells in this deep freezer per the protocol programmed down to a minimum of -80°C without the use of liquid Nitrogen. 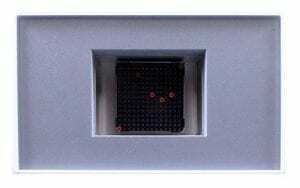 Readings from 3 temperature sensors within the Cryocell are automatically recorded to PDF format. The cryogenic cell samples can then be transferred to a large -80°C freezer for long term storage. A built-in heater restores the freeze block to room temperature in preparation for the next cell cryopreservation protocol, increasing cryogenic storage throughput. 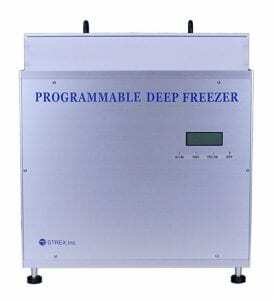 Maintain high cell viability with this unique freezer. 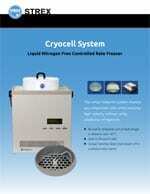 Cryopreservation is optimized due to the Programmable Controlled Freezing Rate this system is capable of. A very user-friendly interface allows custom freezing protocols to be programmed and cells to be preserved immediately. Simply program, place your vials, and preserve. Always be ready to preserve your cells and enjoy extremely low running costs thanks to the strong Stirling Cooler within the Cryocell. Liquid Nitrogen will not be necessary with the Cryocell system. The freedom from Liquid Nitrogen allows more resources and effort to be focused on the cells and tests in the lab. Scheduling and paying for Liquid Nitrogen deliveries each week will be not be part of your efficient cryopreservation work in the lab with the Cryocell. Many freezers require a moving team to relocate and a large space to house. The Cryocell occupies minimal floor or bench space, despite its strong cryopreservation performance. The standard system also weighs in at only 12.7 kgs (27.9 lbs) and is outfitted with a large handle to ease portability. Movement of the system to a collaborator’s lab or into the field allow diverse applications for cryopreservation needs. Efficient heat transfer is essential for effective cell cryopreservation. Our systems are outfitted with freeze blocks machined to the users’ exact vial size and type in order to achieve this. 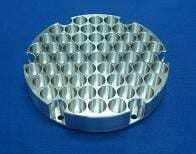 Other models of the Cryocell utilize an ethanol bath that an entire vial rack (or 2) can fit within to increase throughput. Greatly increase cryogenic storage preparation throughput with this high-capacity ethanol bath model. This configuration is able to fit 2 ANSI sized 96-vial racks or a single unit of a larger rack (150 x 200 mm inner dimensions). Quickly load and remove your cryovial racks to improve your productivity and decrease the chance of thawing while transferring individual vials. Contact us for more details. Our typical Cell Frezer model has a capacity of 55 cryogenic vials (0.5-2 mL size) with up to 1 mL sample volume. Other models are available which expand the capacity of the Cell Freezer System to 100 samples with 1 liter for the total sample volume. Custom sizes and designs are available at no additional charge. Please contact us today for more information on how we can customize your needs.